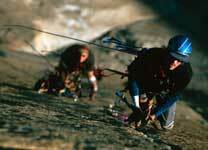 Steve Schneider on the Shield Headwall, El Cap. Thirty years after the Golden Age, Yosemite Valley remains a mecca to big wall climbers. The reason is clear: there is no place on earth with the same combinations of size, rock quality, good weather and accessibility. In short, its damn hard to find a better large rocks to throw yourself at. The 54 climbs listed below are among the most classic in Yosemite. Topos of all of Yosemite's best big wall climbs are available in our guidebook Yosemite Big Walls: SuperTopos. See current big wall anchor conditions at the ASCA web site.